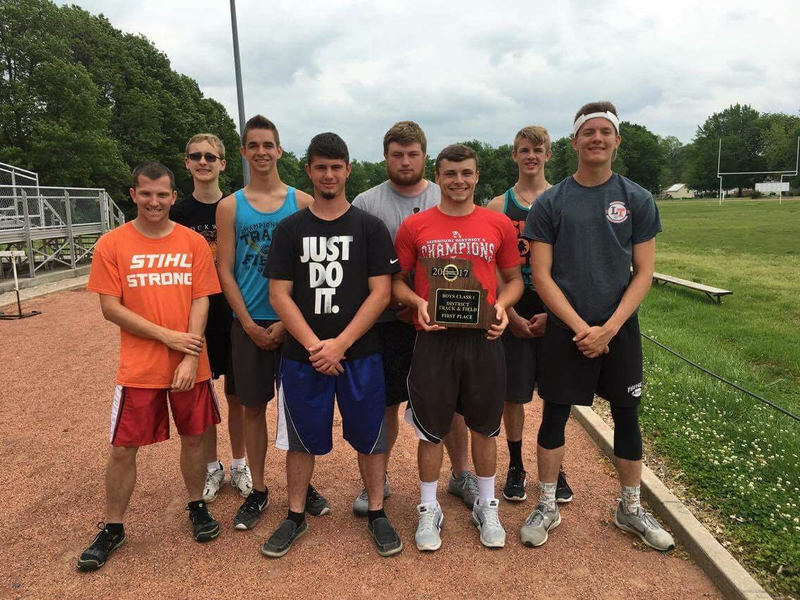 The Lockwood boys track team won their first district title since 1992 at the meet held in Hollister on Saturday, May 6. 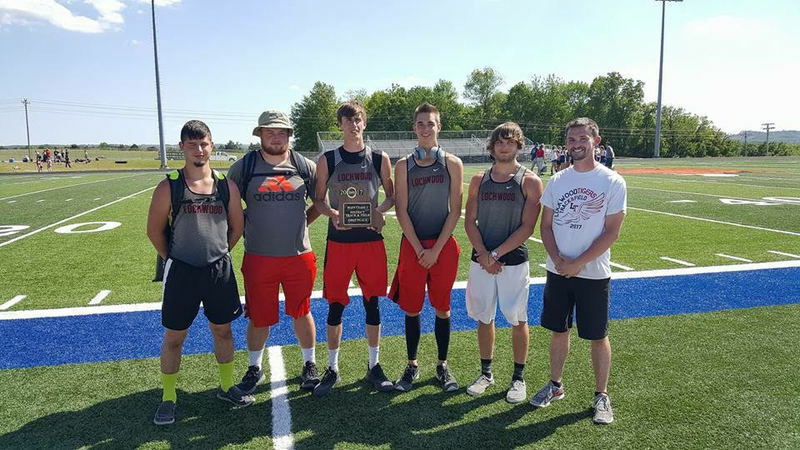 The following athletes also finished in the top four and will compete at the Sectional meet in Camdenton on Saturday, May 13: Ethan Bates - shot put, discus, 4x100 relay; Dakota Cooper - long jump, triple jump; Jobe Edwards - 110m hurdles, 4x200 relay, 300m hurdles; Justin Nentrup - 4x200 relay, 4x100 relay; Luke Nentrup - 4x200 relay, 4x100 relay, 300m hurdles, 200m dash; Logan Sparkman - 4x200 relay, 4x100 relay; Brady Waters - high jump, long jump, and triple jump. The boys are coached by Luke McKinney. The girls track team also had a successful day finishing fourth overall in points and the following girls qualified for sectionals: 4x800m relay placed 2nd (Makenzie Purinton, Mckenzie Kennon, Noble Foster and Kaylee Kennon), 4x100m relay placed 1st (Kaylee Kennon, Victoria Deuchert, Noble Foster and Mckenzie Kennon), Hope Dunagan placed 2nd in Discus, Noble Foster was 4th in Triple Jump, Kaylee Kennon was 2nd in the 800 meter run and 3rd in the 3200 meter run and Makenzie Purinton got 4th in the 1600 meter run. The girls are coached by Jamie Roschevitz. Pictured- Back Row: Tyler Aldridge, Luke Nentrup, Ethan Bates, Gaege Queen. Front Row: Noah Schnelle, Jobe Edwards, Brady Oeltjen, Logan Sparkman. Pictured- Jobe Edwards, Ethan Bates, Brady Waters, Luke Nentrup, Dakota Cooper, Coach McKinney. 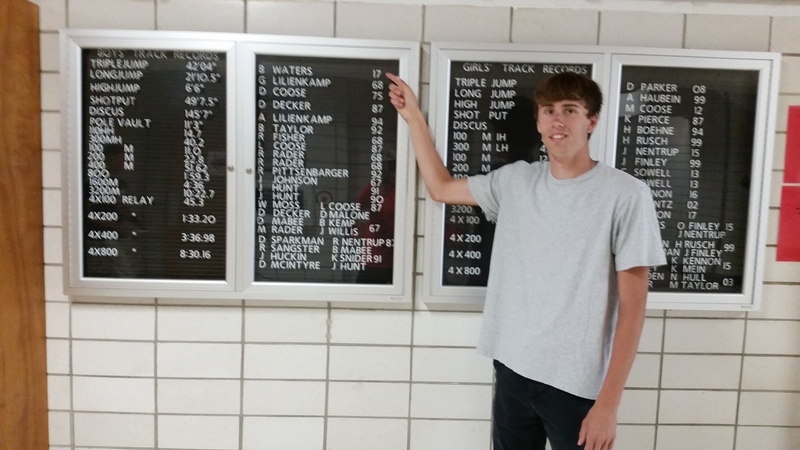 Brady Waters jumped 42' 4" in triple at districts breaking his own school record from earlier this year.